We have a great offer for those who never tried circus before and want to join our circus classes. For months of December 2018 and January 2019 we are offering 20% discount on any block of 4 classes purchased! 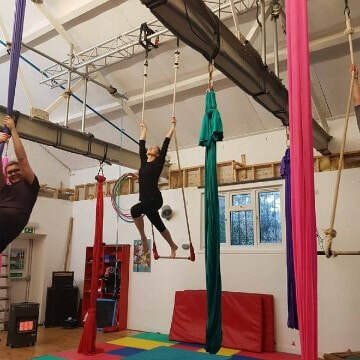 Every month, we are running taster sessions for those who have never tried aerial before and would like to try it out before enrolling on a full course. Do you remember the last time you did three totally new and crazy things in just one hour? That's exactly what this taster class is offering you - trying out the three amazing aerial equipments. You'll get a chance to climb the silks, hang out on trapeze and jump up on a hoop for a while. Great fun and new discoveries guaranteed!